I converted my domain name This1That1Whatever.com to goo.gl/rlvt. This offers the use of a much shorter URL which I can post to social networking sites, email messages and elsewhere. 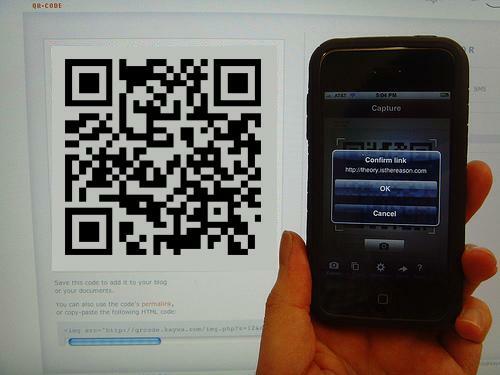 The corresponding QR code (the matrix barcode on the right) can be scanned by QR scanners and allows mobile phones with a camera and smartphones to scan the image so that the link can be visited. Google has made this service publicly available in September 2010 with its own web site at goo.gl. Prior to that, it has been used in other Google services such as Google Toolbar and Feedburner. In addition to providing the shortened URL, the service also provides a QR code for the shortened URL. At present, it is not known if I would get the same search engine ranking advantage using the shortened URL http://goo.gl/rlvt as opposed to my domain name http://This1That1Whatever.com. This is a topic of consideration moving forward. Since joining Twitter, I have come to realize that it is best to use shortened URLs in tweets because it leaves room for retweeting. A tweet is limited to 140 characters and a retweet adds the Twitter profile name of the person whose tweet is being repeated. Since Joining Facebook, I have also come to realize that it is suitable to use shortened URLs in Facebook comments. The management of many shortened URLs is a task but is necessary for optimal operation on social media networking sites. which came very close to having the URL truncated. Using the shortened URL (just an example goo.gl/VGkUfJ) would leave more room for a retweet which can be re-retweeted.